The Pub Guide is long-overdue a lick of cyberpaint, to drag it kicking and screaming out of the graphical world of 2002. So things might look a bit odd for a few days (actually, several months at the pace I work). The main blog part should continue to operate as normal - so post away! - but some things may not be where you expect them to be for a while. And we've already used the engineers' favourite expression "well it's fine leaving us" (ie. on a Mac at home) once - expect to hear it several times more before we're done! 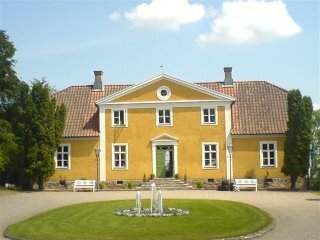 Anyway, back in Denmark, after a day wandering about we had a rare opportunity to go out and get bladdered, so we thought we'd try and find somewhere nice to do it. A look at the guide book, a bus ride and very long walk later we came across this place. Which was a nice surprise, as we had been walking through a built-up residential area (the equivalent of let's say, Camden in relation to central London) on a Friday night and slowly coming to the conclusion that Scandanavia is spookily empty, even in the cities. However, once inside we found a huge, bustling low-lit restaurant and bar, very reminiscent of that brewery/bar/restaurant we all seem to have been to just off Borough Market. 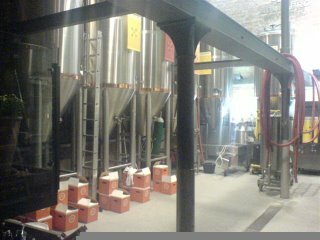 They brew 8 different beers on site. The weakest being 5%, the strongest, and my personal favourite being 8%. We had fun finding out which ones we liked: The Czech-style lager (top left), The New York-style lager (one along to the right), The Ravensborg Red beer (one along to the right of that - very much like the St. Peters red ale over here), the Bombay Pale Ale (bottom left - again as you'd expect), and the St. Hans Dubbel (bottom right - the strong feller - cloudy and lethal). In fact the only one we weren't keen on was the Graupner Schwarz, which is brewed with coffee (bottom row second from right). The staff were fab, explaining how each beer was brewed and even offered an a la carte menu which tailored specific beers to each dish. Given the tasting menu of 4 x 10cl of beer ie 400/586ths of a pint cost the equivalent of £5.50, we demurred and instead let one further pint each see us through some excellent modern danish cuisine (plaice for Nic, venison for me, all beautifully presented). If you ever happen to be in Copenhagen, this place is definitely worth seeking out. 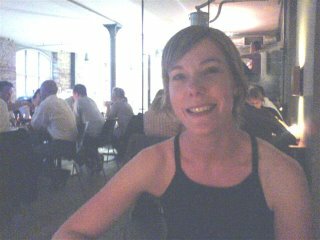 Dinner for 2 (including drinks and a shared pudding) camed to 700kr which appeared on my statement as a reasonably reasonable £66. And we were quite pissed. Note: Ryesgade is a very long street, though, so make sure you head for the Western end of it where the Bryghus is situated. Kirkstone Pass is one of Cumbria's most notorious roads. It forms part of the A592 going from Windermere to Ullswater, has gradients of upto 1:20 and rises to around 1500ft above sea level. When the weather gets bad, the road is impassable. Seems only sensible then, that someone should stick a pub at it's highest point. The Kirkstone Pass Inn is the highest pub in Cumbria and the third highest in England, and has been a haven for weary travellers since 1496. The interior reflects the age of the pub, all oak beams, flagstone floors and wooden trim. It is cosy and the staff were very welcoming and exceedingly friendly. The bar had three real ales, two from local breweries, as well as lagers and Guinness. Father-In-Law and myself sampled a half each of Hawkshead Bitter, which was very good. They also do food, but we'd just stopped in for Lady Pie to use the toilet on her way home. Maybe we'll eat next time. Like any good pub, they also have a Pub Dog, Stanley and their very own ghost, (I didn't manage to get a picture of either of them). Possibly the best thing about this pub though is the view from the beer garden. This is the perfect local. 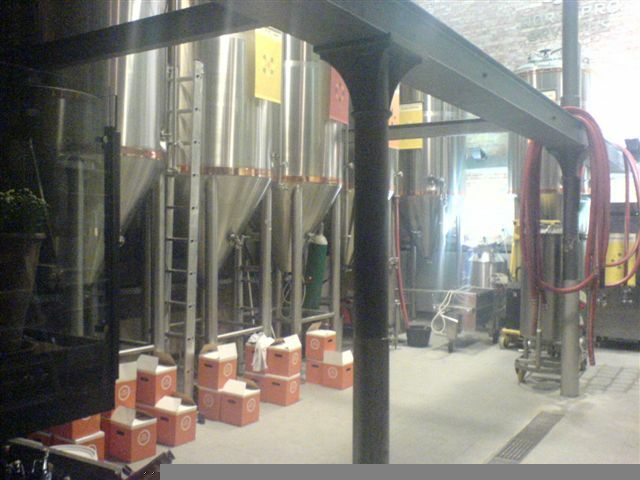 Quiet, friendly, good beer, nice ambiance with some stunning views and scenery. It's just a shame it's a bugger to get to as one of you has to be the designated driver. Having said that, there is a bus stop outside the pub, but I think the service is what some would describe as 'limited'. We plan to go back when Sister-in-law comes to stay. I was meant to be going up to London on Tuesday 13th for a meeting, but there was a fire at Raynes Park so all the trains were cancelled in both directions. We were being held at Surbiton (which from the outside is a mighty fine example of art deco design. From the outside, at least). This was the hottest day of the year so far and so rather than try and fight my way up through some torturous route I cancelled and asked if my father-in-law could be persuaded to come and pick me up. 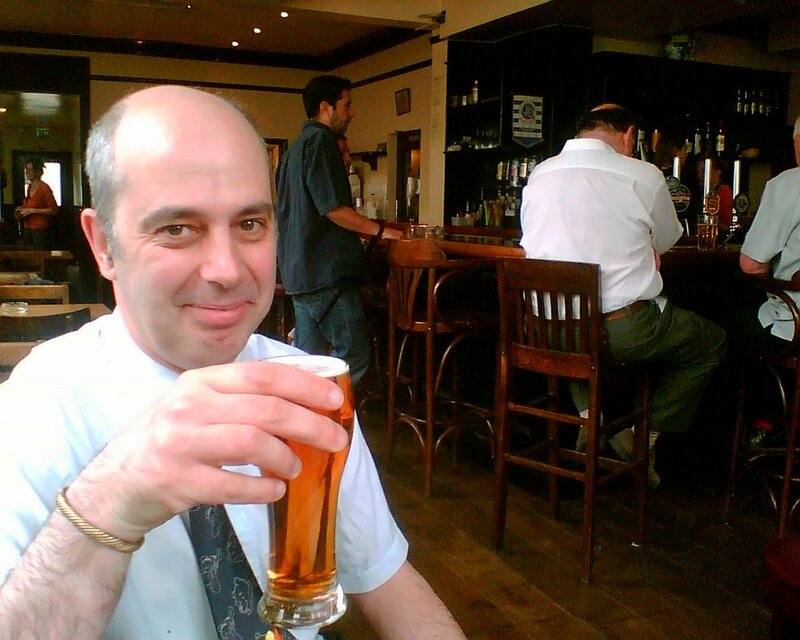 He could, so whilst I was waiting I went for a pint in the Surbiton Flyer right by the station. It's a nice enough pub - recently renovated to look like a normal, non-gastro enterprise rather than anything more pretensious. World Cup on telly. Black and white tiles on the floor round the bar. Fullers and all the usual on hand pump. The thing that set it apart was the bar staff. Both bloke and lady manager were lovely and friendly and went out of their way to make me feel welcome. Given I was quite clearly a stranded solo one-pinter, their attitude was, I thought, very genuine, and it made me happy. So if you ever have the misfortune to be stranded in Surbiton - have no hesiation in making the Surbiton Flyer your first port of call. As regular readers will know, there is nothing worth seeing north of the congestion charge zone or Circle line. On my previous visits there, most residents of this area have sported odd haircuts and will try to sell you skunkenweed. But you'll do anything for a good friend and/or The Anorak Stacey Harris. 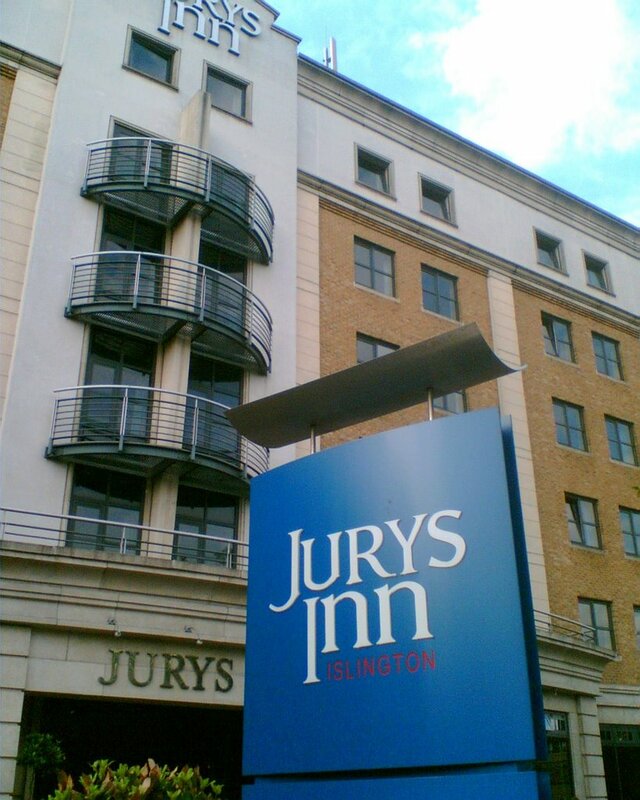 So when he invited me to the glamorous Jurys Inn, Pentonville Road, close to The Angel Islington, for a drink after a BT-related meeting, I agreed against my better judgement. It wasn't a good start when I was charged £3.20 for a pint of Carling in a mock-Tudor hotel bar, that was showing a World Cup match between two teams that I couldn't even work out what the three-letter abbreviations on the scoreline stood for. 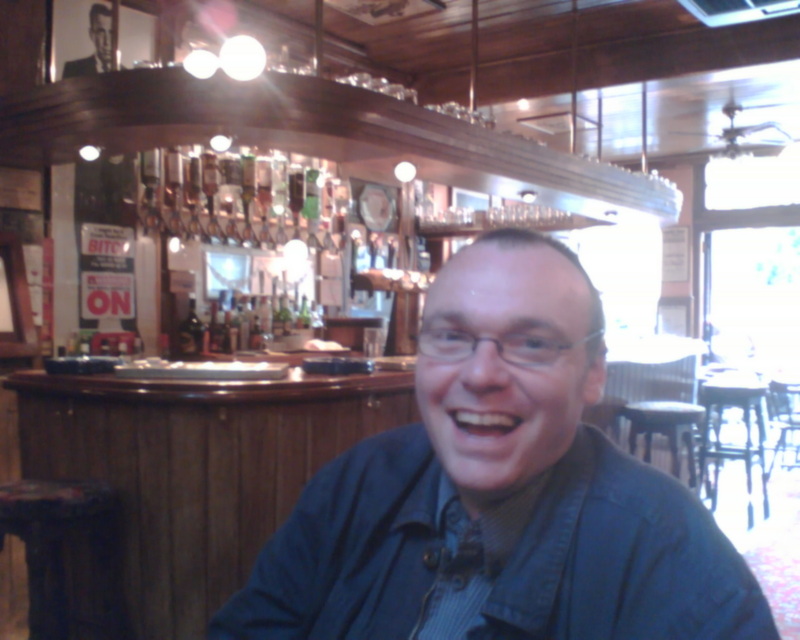 But once outside, things improved, and we found three good pubs. Next to Jury's is The Castle. Now this is tricky. 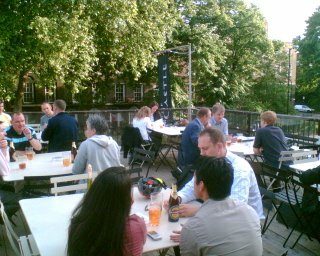 It's a good pub, with decent beers, but I fear we were seduced by the roof terrace. It was a nice sunny day, and we enjoyed sitting out here. But I worry that we are thinking like Londoners here - because while we were saying how nice it all was, at the end of the day, we were sitting on a shop roof, overlooking a red route with roadworks on it, and a view of a tree. The Lake District it is not. But in London, you should be thankful for this, I guess. 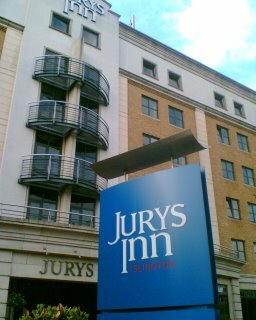 We walked from there through some rather nice upmarket squares to The Harlequin in Arlington Way, round the back of Sadlers Wells. It was empty. There were two people sat round a corner, possibly conducting an affair. Plus the landlady who looked scary but actually wasn't, Lord Harris of Jingle-shire and I. The not-scary-landlady explained this was like The Pit Bar in the Old Vic: very busy before and after performances at the theatre, but empty during. Anyway, we listened to some dodgy eighties tracks and enjoyed having the place to ourselves. 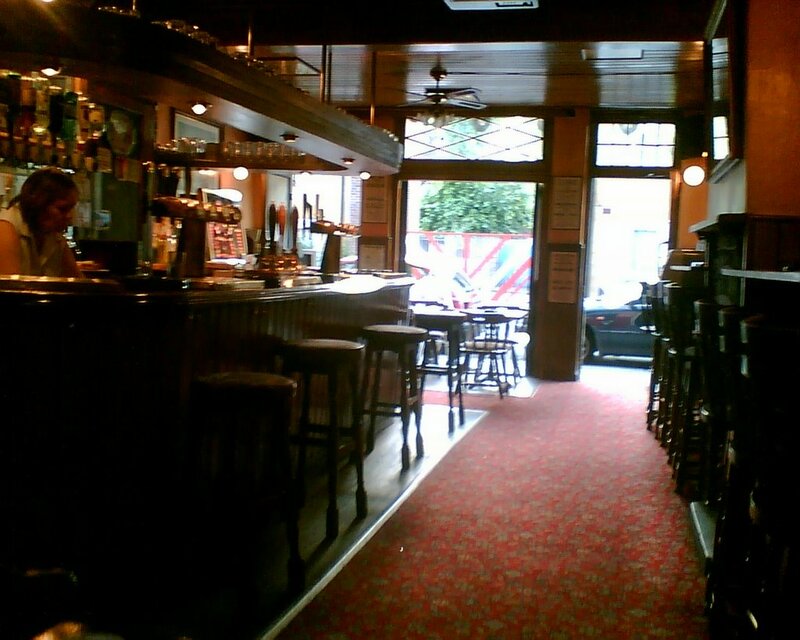 Overall, it didn't seem to have changed in years, with lots of sixties/seventies woodwork. If you're in the area at the right time, and want an old-fashioned small pub, it's a great find! 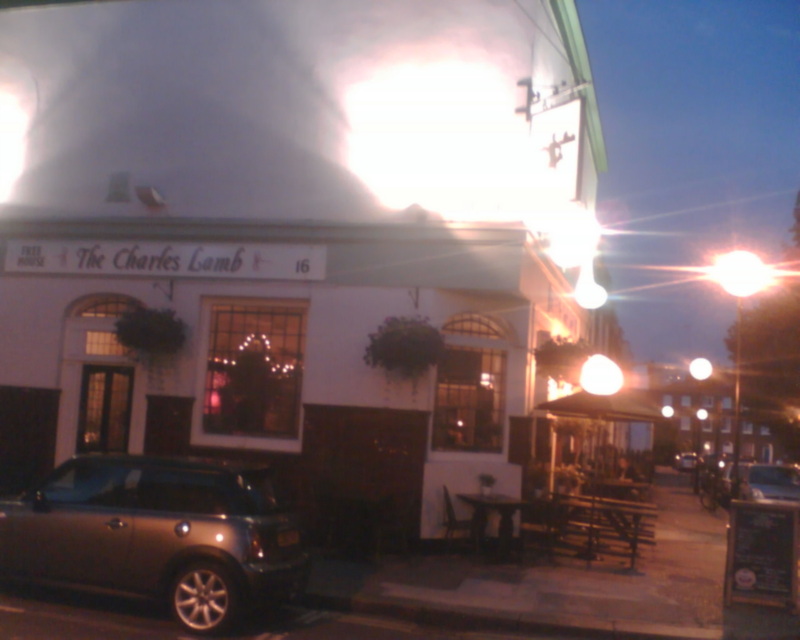 Then a walk back towards the Angel and off east took us to The Charles Lamb on Elia Street. This seems to be comparatively new, after a refurbishment in February. There were some good beers, and the food looked good; but the star of the show is the pub dog, Mascha and her fetching bandana. We tried to photograph her for the guide, but all we got were blurs - we later found out she was over-excited as her owner had been locked in the cellar earlier in the day, and Mascha had howled until someone came and rescued her. 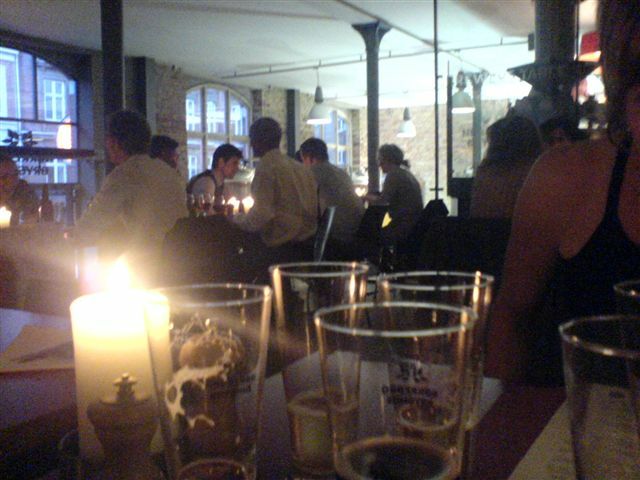 As we sat at one of the tables and Mascha ran around, we realised we really liked this place. 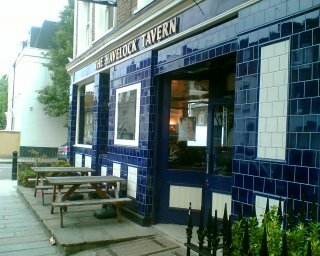 Despite accusations of it being full of Islington yuppies, we thought it was a nice friendly local, and one of those pubs that you wouldn't mind having at the end of your road. If there's another BT course that means Stacey has to go north of the river, we'll probably come here again. I guess it ain't all bad up Norf London. I had lunch there today with Nic, Amy and a friend, and I spent most of the time in stupified disbelief that this is going to be my local. It was gorgeous. 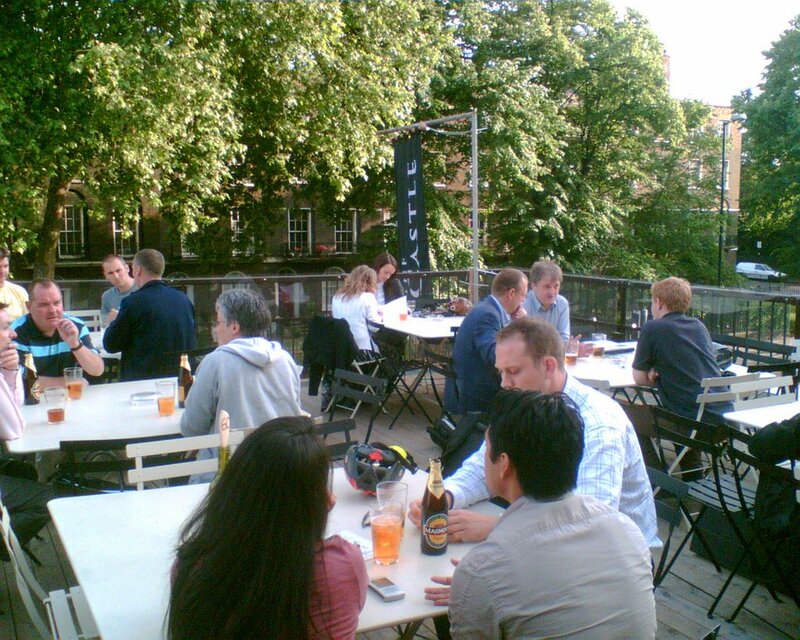 We sat outside right by the river underneath a huge canopy with a busy Friday lunchtime crowd. 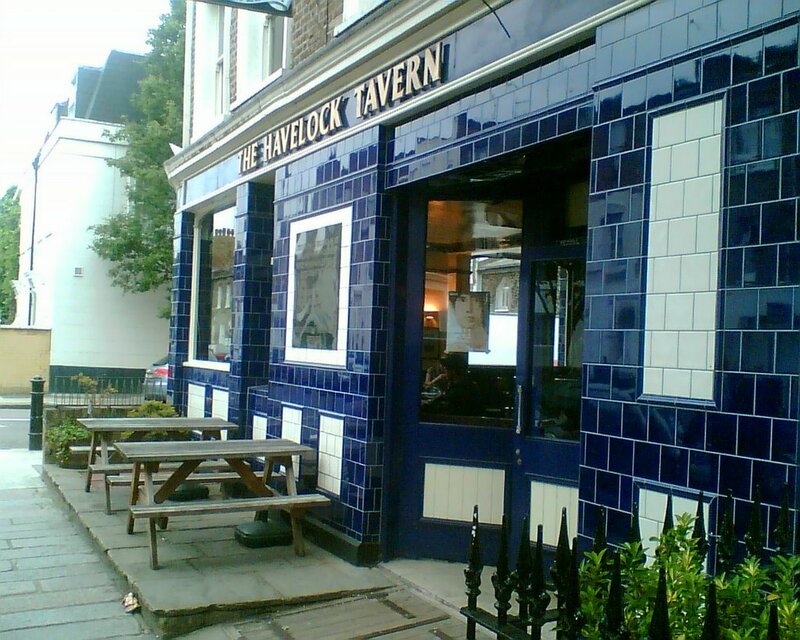 We were able to book, which pubs don't often do for outside tables. Amy sat in a high chair and just stared in amazement at the swans and boats gliding by. There wasn't a bit of traffic noise, despite being reasonably close to the town. The river and posh houses over the water (the Thames is about 50m wide at this point) just looked glorious in the sunshine. 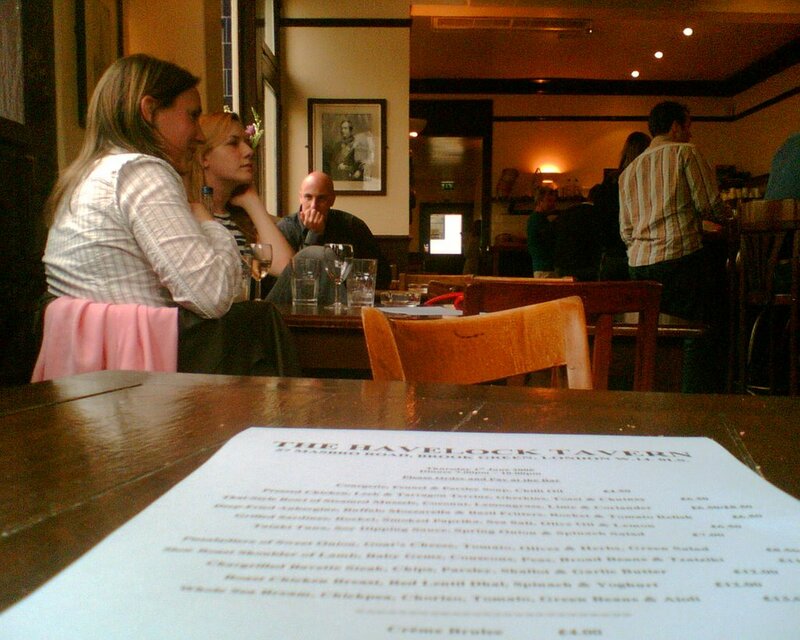 Inside is refurbed to a good standard, no smoking upstairs and typical gastropub menu. It is on the expensive side - £7.25 for a Neal's Yard cheese ploughmans which was frankly stingy on the cheese and butter front and came with stale bread. 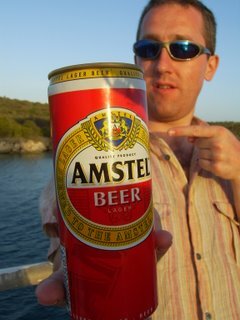 I didn't have a pint, being a responsible pro (don't splutter into your tea! ), but they do serve various Fullers plus a guest ale. I had a v enjoyable London Pride last time I went and I think it was only £2.50. 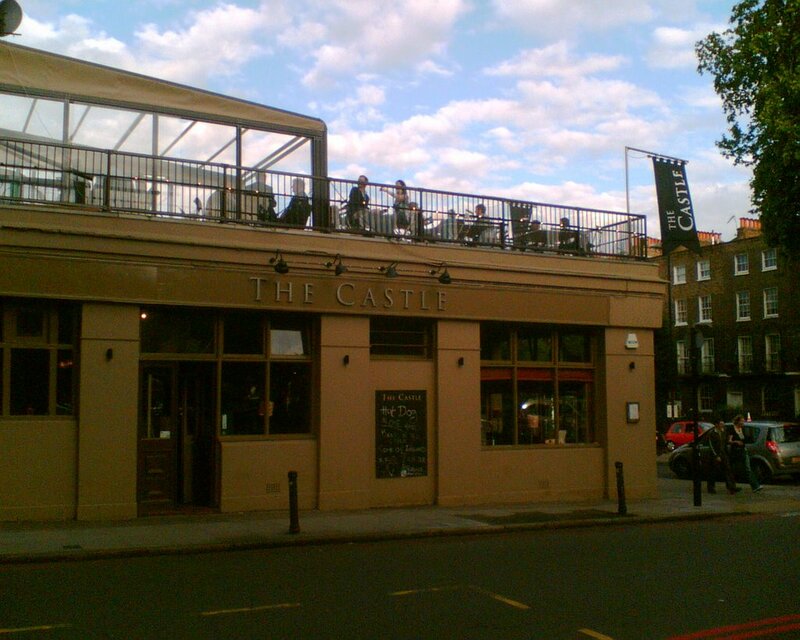 The upstairs bar is screening the football with bookable and waited tables for the duration of the world cup. After this experience the house sale is almost guaranteed not to go through. Still if it does, I reckon we deserve a place like the Anglers after doing 5 years penance in the pub wastelands around Kilburn and Willesden. If any of you fancy an early recce to the environs of Walton on Thames to see if this place really is that good, give us a shout - it would be my pleasure. Never usually know what to think about this pub, but last night's foray with Willum has convinced me that they've finally got it right. Sorry about the lack of photos. We forgot. And my handy phone-cam is bust. They've softed the previously sparse gastropub decor with a few drapes, and the overall effect - dark walls, arty things and nice thick chairs and tables is cocoonishly comfortable. This is despite the huge windows which look out onto Great Portland Street tube station, advertising giants Grey's HQ and the relentless traffic of the Euston Road. First surprise was being served a cool, lovely pint of Spitfire (4.5%, £2.60) in a jug. Hurray!! That's twice in two pubs (first being the Eagle, see below). I think we're spotting a trend here and long may it continue. The other ale was Timothy Taylor (4.3%, can't remember how much it cost, but I had it as the last pint of the night and it was just as good). Second surprise was how quiet it was. Busy, certainly, but not rammed, despite being prime swifty-after-work time. I guess everyone else was looking for a pub with a few outside tables/drinking space. It was great as it meant we got a prime seat and the aircon did its job perfectly. At 7.30pm Will turned up (after being bored to the teats by Vanessa Shimmeringlumpofnoisejelly Feltz) and we went downstairs to watch the final heat of Funny Women 2006, which culminates in a final at the Comedy Store in July. 19 women, 5 minutes each. Will's friend Viv was performing, as was my friend Jen. Both acquitted themselves very well. 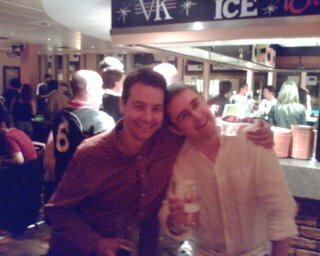 As the only table of all blokes watching blink and you miss it turns from so many different people (the standard varying from unbelievably funny to er, very nervous) the evening took on quite a surreal turn as we steadily made our way through the beers. My pick of the bunch was the blonde, studenty one (Will can you help here?) whose wordplay and bewildered delivery was first class. She was a bit rough round the edges though and I think some of the more polished performers (the third and fourth ones on - Will?) will probably go through. I was delighted to note that our last, one-for-the-road, round actually finished off the Spitfire barrel. Hurray. I think we may have taken 20-odd pints out of it between the three of us. Erk. 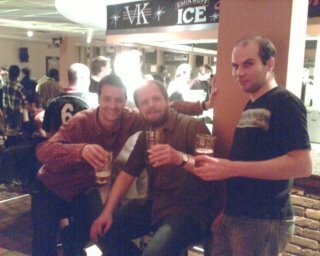 Unfortunately the time spent consuming that last pint led to a certain nervousness on my part about making the last train so I ended up taking a cab to Waterloo, making the journey home cost a total of £22.50 (taxi at Weybridge end too). Ouch. So, a cracking night out. Good to catch up wiv Will and Matt, lots of very bizarre laughs and an excellent pub to boot. Double Hurray. Clearly the choice of drinking vessel was made in accordance with the recent Europe-wide directive, which stated that the 'pint', as an imperial measure, could no longer be used for international competition. * As you will be aware, the Caribbean island of Curacao qualifies for entry into the European heats, on grounds of it being a dependency of the Netherlands (c.f. the Jagermeister Directive, 1923). Think you can do better? Mail me your entries! This week's pub-related adventures have seen another good new find and a return to an old favourite. 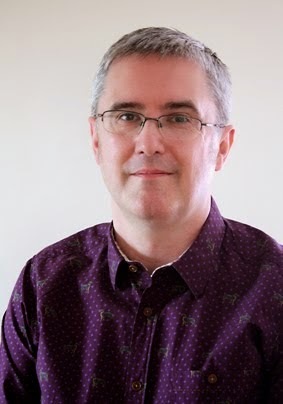 Thursday and Friday saw me sitting in a windowless room on the 3rd floor of the Olympia Conference Centre, learning about the bright shiny new future of wireless at the Digital Radio Show. The previous time I'd been at Olympia was for the Great British Beer Festival (this year moving to Earl's Court, so keep the first week of August free! 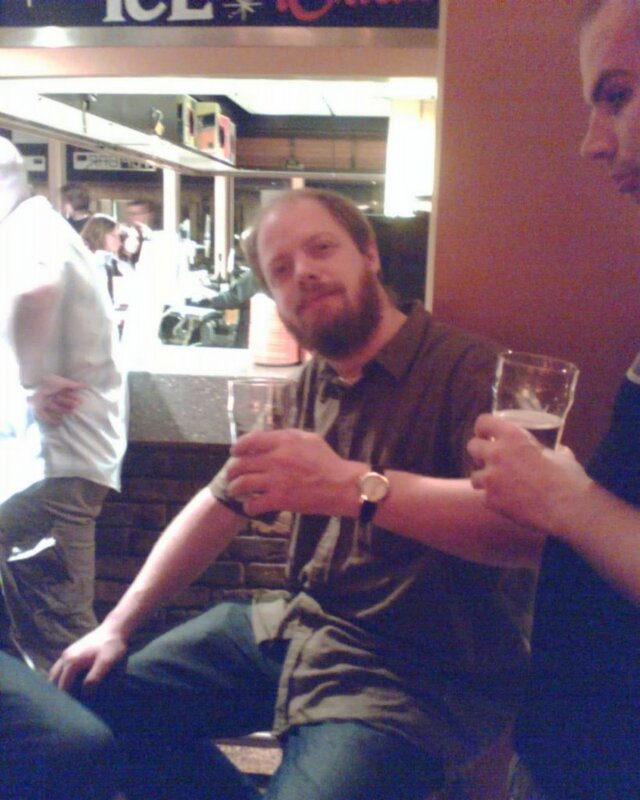 ), which prompted thoughts of a pint afterwards. 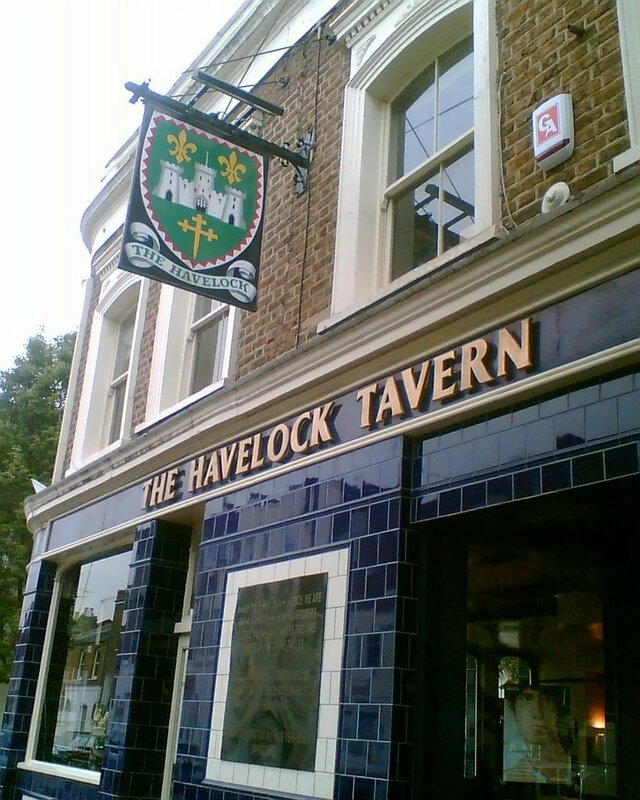 So, a check on the Good Pub Guide sent us to the Havelock Arms, about five minutes walk from the centre in a rather upmarket villagey area of W14. Inside, it's what's now becoming the standard upmarket pub formula of a big open-plan room with big tables and school style chairs, good food chalked-up on a blackboard, and two or three decent beers on handpub. It's worth the short walk from the Conference Centre if you're in the area. Then on Saturday, a crowd of Essex University's finest alumni descended on the student radio station, now called Red, to try to help restore the place to its former glory. Obviously this was all just a front to drink cheap beer for an evening, and cheap (for the South) it was too, with Grolsch at £1.95 and Carling at a bonkers £1.65! Even in the allegedly more upmarket Top Bar, Big Garders bought five pints of premium lager (not all for himself) and got change from a tenner!